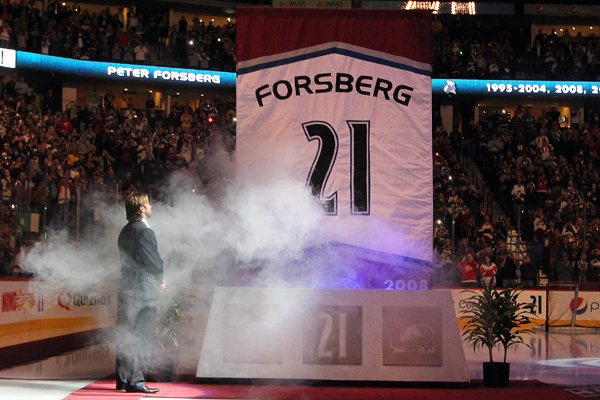 Peter Forsberg's #21 became the retired number in Avalanche history last night, as it was raised to the Pepsi Center rafters in an emotional pre-game ceremony. It was a great ceremony (especially the beginning, when Forsberg entered by shaking hands with some of the fans in the crowd and then taking a lap around the ice on the red carpet) and a satisfying goodbye to one of the most beloved Avs ever. Colorado also took a moment right before the opening faceoff to honor Wade Belak, Ruslan Salei, and Karlis Skrastins, the three Avs that were lost this past summer. The team also announced that they will wear a decal in remembrance on their helmets during the season. As for the actual hockey game - the first meaningful one in over five months - it got off to a pretty good start, with the Avs taking a 7-2 advantage in shots on goal. But by now you know the story. The Avs lost 3-0 and were outshot 39-29. Semyon Varlamov had a very strong debut. He stopped 36 of 38 shots and really displayed his athleticism. Both shots that beat him were wicked slapshots that came on odd-man rushes. Keep in mind that the goal scorers (Franzen, Zetterberg) aren't exactly slouches, either. Varly is going to be a great goaltender if he can stay healthy. For once, Avalanche fans weren't cringing every time a shot got through. Erik Johnson and Jan Hejda were the only Avs to play over 20 minutes. Johnson was a bit shaky, and he made some turnovers which didn't look good coming from the franchise defensman. Hejda, on the other hand, proved to be rock solid in the defensive zone. He may have slightly misplayed a 3-on-2 on the second Detroit goal, but overall he was very impressive. It was also nice to see Hejda put pucks to the net. Though he was only credited with one shot, there was more than one occasion that Hejda let shots go from the point. Gabriel Landeskog's debut saw the rookie pocket five shots and just over sixteen minutes of ice time. Landeskog also saw time on the power play and penalty kill. The rookie looked comfortable and drove the net at every opportunity. He did make one egregious turnover in the defensive zone, but I think Avalanche fans have a lot to be happy about from the #2 pick. Loved seeing Ryan O'Reilly more active in the offensive zone. He's going to score 20+ goals this year. Peter Mueller just missed scoring his first goal in a long while. He's another guy in for a big year. I really liked Shane O'Brien. He didn't play a perfect game, but he was physical throughout and was pretty quick to jump into the play when necessary. Wasn't it nice to see the Avalanche not be pushed around for a change? The defense was physical and made the Red Wings pay for going to the front of net. Penalties really killed Colorado's offensive flow. Three penalties in the first period contributed to the Red Wings taking control of the game. Still, the penalty kill was a perfect 4 for 4. The power play was anemic. That's going to have to change for this team to be successful. Losing 3-0 (especially to the Wings on opening night) is never fun. Avalanche fans need to keep in mind that this was only one game on a long journey to what is hopefully a postseason run. If anything, fans should be encouraged that it was the offense that sputtered in this one. The goals will come, and if the defense plays well in front of Varlamov, perhaps Colorado will see some hockey in mid-April. Boston. Tomorrow. Freaking 1 PM ET.